Ancient, stone age fish traps and cutting edge fuel-from gas technology; Khoy-San herders and European traders – the history of Mossel Bay is a microcosm of the history of South Africa herself. 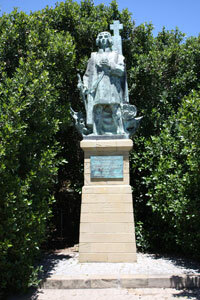 Mossel Bay has always been associated with early European explorers. Bartholomew Dias and his crew sailed into the Bay in 1488 – unaware that they had in fact rounded the Cape of Good Hope – and Vasco Da Gama called in during 1497. It was Da Gama who named the place Aguada de Sao Bras (the watering place of St. Blaize) – and who bartered for cattle with the local Khoi in what is generally regarded as the first commercial transaction between Europeans and the indigenous peoples of South Africa. In 1500, Pedro d’Ataide sougth shelter here after losing much of his fleet in a storm. He left an account of the disaster in an old shoe which he suspended from a milkwood tree near Da Gama’s spring. Incredibly, the report was found by another explorer, Joao da Nova, in 1501 – and the tree has served as a kind of a postal clearing house ever since. But Mossel Bay’s history goes back many thousands of years – which explains the presence of our many archaeological sites. If you want to explore our history, our numerous museums provide a fascinating look back in time – more than just dry exhibition rooms, they’re alive with the absorbing stories of our people and their cultures. In a town where the constant, rhythmic hush of the sea is the undertone that fills the day, the Mossel Bay promise “No hurry. No worries.” is effortlessly kept. And whilst the sea is without a doubt one of the greatest attractions of Mossel Bay – it’s only one of them. Wilderness areas, natural beauty, adventures, a well-developed infrastructure with modern schooling, sports and medical facilities, a vibrant business and industrial community, cultural attractions – and, of course, miles and miles of clean, white beaches. Who, indeed, would want to hurry – or worry – in Mossel Bay? Explore Tanzania with us on Safaris in Tanzania and see the amazing wildlife and national parks that are on offer. Some of the more popular safaris that we offer are a cultural safari to the Maasai tribes and the wildlife safaris to the Serengeti.